This species is extremely wide ranging and is stable and secure throughout its range. 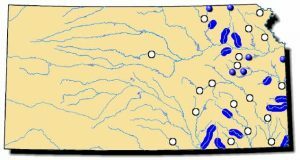 It occurs throughout the Mississippi River basin except for the Tennessee and Cumberland River basins. The range extends from western New York to Minnesota to Montana and south to Arkansas and western into eastern Kansas and Nebraska. It is found as far west as the eastern Colorado border and in Montana and is widespread throughout the interior of Canada, including the western Hudson Bay drainage. Comments: The fatmucket is sexually dimorphic in shape. With age, females develop into a hatchet shape, the anterior end being much smaller than the posterior end. This difference is to provide more room to brood the eggs in her gills while the male’s shape with age is more symmetrical. 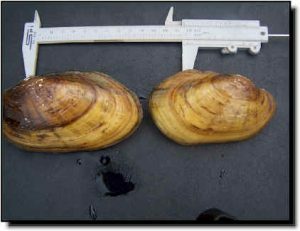 Like other Lampsilis mussels, the female displays a large lure to attract host fish. This lure is less fish-like than others within the Lampsilis group yet still attractive to a variety of host fish. The fatmucket is more likely found in smaller streams and can be found in some reservoirs.